As Washington Capitals owner Ted Leonsis walked toward his suite in Nationals Park about 30 minutes before the start of the NHL Winter Classic, he spotted something that stopped him in his tracks. If you’re wondering what to get for a man who has just about everything, now you know. The 57-year-old Leonsis already owns three D.C. teams — the Capitals, Wizards, and Mystics — as well as the Chinatown arena in which they all play. He is in possession of an estate once known as “the Summer White House” that is so steeped in history that Ken Burns screened his Roosevelts documentary series there in September. A former top AOL executive, Leonsis still works with Steve Case; they invest in fledgling companies through their Revolution Growth vehicle. “We have found we are most effective when we are the lead and largest investor,” the fund’s website explains. But Leonsis is always looking for more. He wants to grab a generation of local sports fans with a championship team. He wants to bring the Summer Olympics to the D.C. area in 2024. He wants that random guy’s nice-looking sweater. 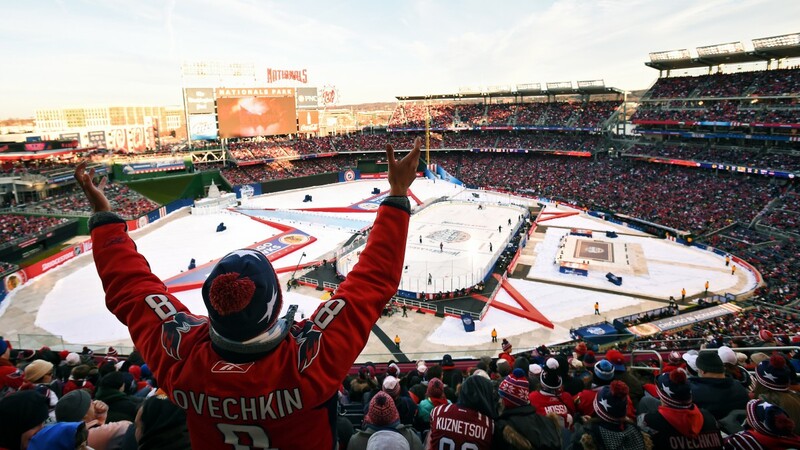 And for years and years, until it finally came to fruition yesterday, he wanted an NHL Winter Classic in D.C.
“He insisted, he was persistent, he was relentless in pursuit of this game,” NHL commissioner Gary Bettman said yesterday. Leonsis pointed to his team’s frequent sellouts, the number of fans who had traveled to Pittsburgh in 2011 for that year’s Winter Classic, and the strength of local youth hockey. And he was sure to point these things out to the league at any chance he could. Twenty-four hours later, it was all finally happening. After a morning of interviews — with SportsNet, with NHL Network, with The Weather Channel — he made his way toward his seat. It was a couple-minute journey that took much longer, because Leonsis has a habit of stopping to chat. “You gonna be warm enough? !” he asked a kid in a jersey. (Before the game, Leonsis had posted on his blog, Ted’s Take, to “please bundle up, wear layers, hats, gloves, double up on socks.” He himself was wearing a thick maroon Capitals parka and a stars-and-stripes linen scarf.) The child’s mother assured her favorite team’s owner that despite all appearances to the contrary, her son had on warm stuff underneath. Spotting a man in a bright blue coat across the way, Leonsis pointed and shouted, “I know that’s real Canada goose down! Best there is!” He shook hands with Blackhawks fans and thanked them for coming to D.C.
Leonsis high-fived the fans who yelled “TED!” — everyone seems to be on a first-name basis with the guy — and indulged the ones requesting selfies. He gamely endured personal-space encroachment from strangers who came out of nowhere to rub his shoulder or pat him on the back. He remarked on all the ugly Christmas sweaters he was seeing and was informed they are currently all the rage, that some sizes had sold out on the NHL store. He said hi to beer hawkers in their fluorescent vests. At last he got to his suite. “Well, now I can finally have fun,” he said, closing the door behind him. A few minutes later, though, he was back out in the crowded hallway, mumbling that he had to go track down one of his guests. He returned with John DeGioia, the president of Leonsis’s alma mater, Georgetown, and an old friend. The Winter Classic began as a made-for-TV spectacle, a way to create a midseason tentpole to draw sponsors and drive ratings. Along the way, though, it’s become something more: a local festival, a hockey jamboree. Between the Winter Classic, the Heritage Classic, and the numerous outdoor Stadium Series games introduced last season, the novelty of outdoors hockey has certainly faded. (Ratings for yesterday’s game were the lowest they’ve been since the event began.) But talk to fans in just about any NHL city and you’ll find they’re clamoring for the event to come to their town. But they mysteriously never mention the kids tugging excitedly on their parents’ hands, or the Metro cars stuffed with hockey sweaters, or the players hosting groups of 50-plus friends and family — all hallmarks of the shared beauty of communal enthusiasm. (Speaking of beauty, the little replica of the Capitol building and its reflecting pool looked fantastic.) Sure, it was sunny in the first period — Chicago’s Niklas Hjalmarsson would later declare it dangerous, though most other players disagreed — but without the sun, we wouldn’t have gotten Karl Alzner skating in Oakleys. And let’s not forget that yesterday’s Winter Classic was, even underneath the fireworks and the flair and the F-16 flyover, a pretty excellent game. The Capitals led off scoring seven minutes into the sunny first when Eric Fehr netted an unassisted breakaway goal. (He’s something of a Winter Classic whisperer: In the 2011 Pittsburgh game he scored twice.) Alex Ovechkin gave Washington a 2-0 lead about five minutes later when he banged home a rebound, his 18th goal of the season. As usual, his celebration involved a gap-toothed grin, a leap into the air, and — fitting after Idol’s pregame performance — a rebel yell. Chicago’s Patrick Sharp chipped away at Washington’s lead with a power-play snap shot from the point that sailed past players and shadows to narrow the score to 2-1. Early in the second period, Ovechkin hit a crossbar and a post — and those pings and clanks reverberated even louder once Brandon Saad tied the game 2-2 a couple of minutes later. It looked like the game was going to be another extra-session Winter Classic; three of the previous six contests had ended in overtime or a shootout. But with just 1:13 to play, Toews was whistled for a questionable hooking call, one of many quick whistles throughout the game. With the Chicago captain in the box, the Blackhawks lost a center-ice faceoff to Troy Brouwer. Ovechkin carried the puck into the zone, drew a slash, and threw up his hands. Tens of thousands of eyes focused on the shards of Ovechkin’s broken stick flying through the air, most of them not noticing that Brouwer had managed a shot from the slot until the puck was already in the net. The seconds ticked down ever so slowly. Finally the buzzer sounded, and Brouwer — a former Blackhawk whose father had made an all-too-rare trip to see his son play — had the game winner, and Ovechkin an assist. 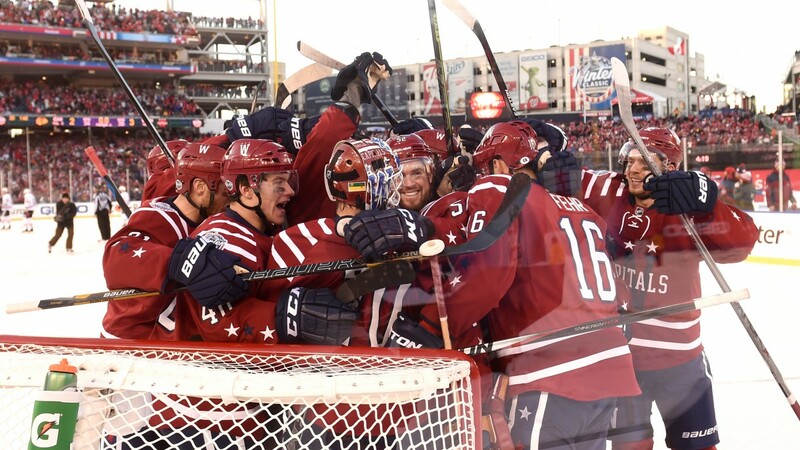 Though it was their first time as host, yesterday was the second Winter Classic for the Washington Capitals. In 2011 the team was matched up with the Pittsburgh Penguins in a game that, looking back, feels a lot like a time capsule. The Capitals and Penguins were considered top Stanley Cup contenders at that point — a season earlier, Washington had the best record in the league — but since then, the best playoff showing either team has had was the Penguins getting swept in the 2013 Eastern Conference finals. Both head coaches from that Winter Classic have since been fired. It’s been a long several years. I asked Leonsis what his favorite memory had been from that day. He noted that the Capitals representation at that game — something like 30,000 D.C. fans made the trip — was strong evidence of the town’s love for hockey and probably figured into getting league support for yesterday’s game in Washington D.C.
Leonsis was always one of those people, though. As an owner, he is so hands-on that he notices if a lightbulb is out, but he’s also long been a big-picture kind of guy.2 And now that one of his biggest projects has ended, he is agitating for more. He thinks his city ought to be a world-class sports hub. He is one of the leads of the bid committee pushing for the Olympics to come to D.C. The U.S. Olympic Committee could announce its decision between D.C., Boston, San Francisco, and Los Angeles next week — on Leonsis’s birthday, he points out. Americans are conditioned to bristle at the expensive idea of the Games being held domestically, but Leonsis notes his model is less Athens and more London, which recycled athlete villages into low-income housing and broadcasting centers into a tech accelerator hub. “There will be no white elephants,” he said. Of course, when it comes to Washington and elephants, the biggest one in the room is the one taking up space where everyone wants a certain trophy to be. Leonsis and the players he employs are well aware that the only real goal is a championship. So, with his birthday coming up, what do you get for the guy who has almost everything? He can probably think of a piece of nice jewelry, but we’ll have to just start with that nice gray Capitals sweater and take it from there. This article was updated to correctly identify the participants of an email exchange between Capitals owner Ted Leonsis and Nationals co-owner Mark Lerner. Numerous teams produce their own local web series, and the NHL hired former HBO Sports producer Ross Greenburg, who now produces a similar show on the upstart channel Epix.